While Trax is a simple game to learn, there is plenty of scope for strategic play. Learning to play Trax is one thing, learning to play well is another! 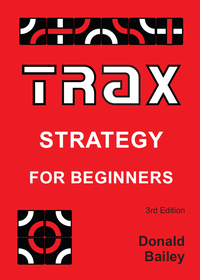 "Trax Strategy for Beginners" guides you through a thorough introduction to the various strategic elements of playing Trax. Description of the game: explains how Trax is played, introduces Trax notation, and defines terms that are used throughout the book. Single loop attacks: introduces the two types of loop attack and shows how they can be formed from corners and connectable pairs. Defending single loops: lists the ways in which a loop attack may be defended. Counter-attacks: shows how to attack while defending, and introduces the concept of initiative. Multiple loops, 2-stage: explains the difference between attacks and threats and shows how to make two attacks simultaneously, concentrating on Ls and variations. Defending L's: introduces the techniques of defending threats, illustrating with L defence. Cave strategies: shows how some attacks into caves cannot be defended. Extends to cave defence, and dead caves. Multiple loops, 3-stage: illustrates how multiple stage threats may be formed and defended, with examples of some of the more important techniques. Line attacks: outlines the techniques that may be used to extend line threats. Line defence: shows some of the right and wrong ways of defending growing lines. Basic strategies: combines the techniques listed earlier and outlines some of the strategies that may be used to gain an advantage over an opponent. Common opening traps: catalogs some of the traps found in openings, and the associated multiple stage threats. Sample game: illustrates the techniques through an annotated sample game which illustrates the scope for strategic play with a passive 12 stage win from only 4 tiles!. 8x8 Trax: describes a variant of the game which has an 8x8 size limit. Introduces techniques that rely on the size limit, such as running out of space and countdowns, and illustrates with a sample game. Loop Trax: describes a variant where players must form a loop to win. Illustrates the richness of this variant through a sample game. Summary: Provides a brief summary of what has been learned in the book. If you can master all that is contained in this book, you will no longer be a beginner!